Church Tour Tickets | ‘Architecture of Faith’ – S.P.P.F. 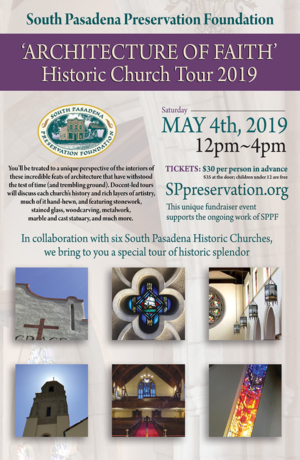 The South Pasadena Preservation Foundation first church tour will give you a behind-the-scenes look at the city’s sacred spaces. You’ll be treated to a unique perspective of the interiors of these incredible feats of architecture that have withstood the test of time (and trembling ground). 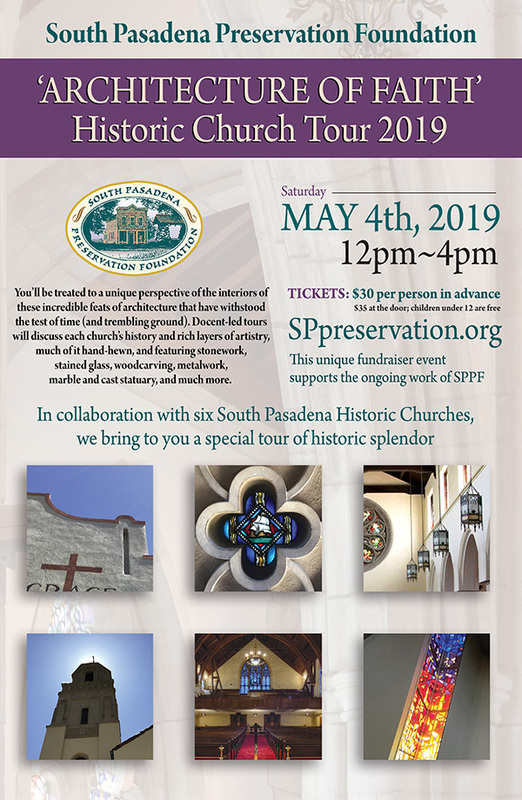 Docent-led tours will discuss each church’s history and rich layers of artistry, much of it hand-hewn, and featuring stonework, stained glass, woodcarving, metalwork, marble and cast statuary, and much more. You’ll start with just a touch of adventure & mystery at the South Pasadena Historical Museum to begin your self-guided tour. Tickets will be $35ea on the day of the event – available at the museum.